I have been covering Jewish film here in Australia for more than 25 years, primarily for “The Australian Jewish News”. It has been a rich cinematic viewing and writing experience. There is no better way to jump into the Jewish experience in film than through the annual Australian Jewish film festival, now called the “Jewish International Film Festival”, this year featuring 60 different films. It recommences in late October in Sydney (Bondi Junction), Melbourne (Classic Cinemas), Perth, Gold Coast and New Zealand. JIFF is no “second run” festival, and has some of the best current releases. I am most looking forward to Natalie Portman’s first directorial effort, “A Tale of Love and Darkness”, based on the lyrical and profound autobiographical book by Israeli novelist Amos Oz, detailing his childhood in Jerusalem during the period leading up to and after the 1948 establishment of the State of Israel. Portman not only directs, but plays Oz’s mother Fania. Portman, you may recall, is the Israeli-born actress (who still speaks a fluent Hebrew), Harvard-educated actress who made her first splash in the first “Star Wars” trilogy. It’s hard to over-state the impact of the Amos Oz book, written in a novelistic fashion, by possibly Israel’s greatest modern writer. At 600+ pages, it’s also a significant challenge to adapt to a single feature film, and the result – although possibly not perfect – is one of those “must sees” for anyone who feels that they must be part of the “Jewish cultural moment”. My friend Tal Kra-Oz attended the Israeli premiere in Jerusalem, was impressed by the film’s ability to capture the look and feel of 1940s Jerusalem, and incisively analysed the challenges that the film faces in portraying Oz’s rich, lyrical and wandering prose. The film has just screened at the Toronto Film Festival, and “Esquire” magazine writer Stephen Marche describes it as “a study of the moment when Jews changed from being a people in the diaspora to a people with a country”. Marche writes that “for American audiences, [this is] a new kind of Jewish film ….”. 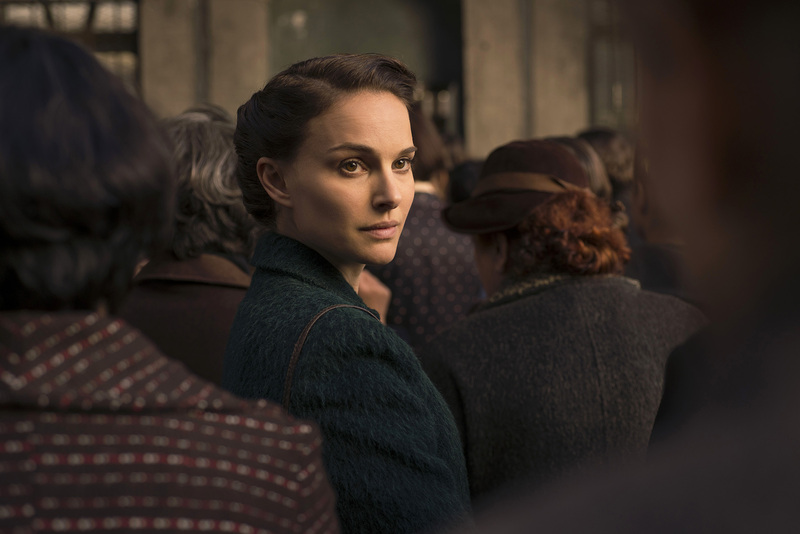 While 1945 was “the end of the story, for Spielberg” (in “Schindler’s List”), it is only the beginning for Portman. Far from being the redemption of history, was the founding of a crisis whose meaning has not yet been resolved. Israel was indeed salvation for the characters in “A Tale of Love and Darkness”, but what follows salvation? Portman’s movie could not be appearing at a better moment. The debates around Israel … so endless, so tedious, so removed from the actual realities of the country and its region … have always taken people as ciphers for political struggles they do not participate in. My second most anticipated film of the JIFF is “Son of Saul”, a Hungarian drama (also at Toronto) that may just win in the February 2016 Academy Awards for best foreign language film. Just when we thought it was impossible to say anything new about the horrors of Auschwitz, this tale of a father who tries to honour his son reportedly devastates audiences with its power. Not every JIFF film will have the impact of these two, but it’s an awfully good start. For more information, go to the Jewish International Film Festival website. I have yet not seen the new Robert de Niro/Anne Hathaway film “The Intern”: it opens here in Australia in mid-October, a few weeks after the US opening on 25 September. According to the trailer (see below), this film has a whole lot in common with another film with which it may be confused: “The Internship” (2013) – which, by the way, for reasons I cannot fathom is MY MOST POPULAR POST EVER (yes. the upper case letters are on purpose). By latest count, I have had somewhere upwards of 4,000 or more views of my review of “The Internship”. From the trailer, one major theme of “The Intern” is that even in this “dot.com” age of youth culture and 25 year old CEOs, maturity, wisdom and experience are still valued. That clearly was a theme of “The Internship”, and what a comforting theme it is … for those who are in the baby boomer generation who see our skills dating and the digital economy undergoing such rapid and profound changes. The “tag line” of “The Intern” is “Experience never gets old”. A fantasy? Perhaps. More like probably. I think ageism in the workplace is a far more significant phenomenon than the professional experience of a 70 year old (the Robert de Niro character) being recognised by a corporation (except, of course, if you are a major investor, with lots of cash … but that’s a whole other story). But “good on you”, Nancy Meyers – a baby boomer if there ever was one (born 1949), for keeping our fantasies alive. There is a beautiful “Jewish moment” in “Me and Earl and the Dying Girl” after Rachel Kushner (played by Olivia Cooke), the Jewish character, dies. People are “sitting Shiva” at her mother’s house after her funeral, and the scene starts off with a disembodied female voice chanting a perfectly accented Kaddish (mourner’s prayer). You never see who chants it, and there is no explanation as to what it is or why, for the uninitiated. It’s subtle, understated and effective, at least for those of us, the relatively small minority, who do understand the prayer. This moment reflects the sort of care that “Me and Earl and Dying Girl” takes – mostly – with its story and its characters. The Jewish stuff – such as it is – is handled with sensitivity and discretion. But not all of the film has that approach. In particular, as Richard Brody (writing for The New Yorker on 12 June 2015) and others point out, the character of Earl is badly written and badly placed in the story. Perhaps I should not be so complimentary about Jewishness and this film. Although I have not (yet) read the acclaimed original novel, in the original book, Greg – the main character – is Jewish (as is the original author, Jesse Andrews), and originally meets Rachel at Hebrew School. So clearly, Andrews knows his “Jewish stuff”. Fascinating that he felt that (or was pressured into?) making his original story “less Jewish”. It’s still a great story, Jesse (I loved the film), but I would have loved to see the screen version of the original novel. Greg (played by Thomas Mann) and Rachel (Olivia Cooke) in a still from the film below. You are currently browsing the Don Perlgut's Blog blog archives for September, 2015.